Every once in a while, things need to be updated. Your mailing address, your wardrobe, your hairstyle, your media collection. Things get outdated, stale, and irrelevant — it’s just the way of our constantly changing world. Unfortunately, your marketing content is no exception. Over time, what once was an accurate, fresh piece of content becomes, well … not so much. Luckily, just like it’s easy enough to change your address, go shopping for stylish new clothes, get a brand new haircut, or buy new music, it’s also pretty easy to update your content. And doing so can help you extend the life of your popular, high-performing content as well as save you the time and resources from creating content from scratch. Not too shabby, huh? So sit back, read on, and learn all about how you should approach and execute the process of updating and republishing your outdated blog content. Your blog readers will thank you for it. Updating Old Content? Why Bother? If you’ve been blogging for a while, I’m willing to bet you’ve got some old, stale content lurking in the shadows of your blog. But why should you care? That stuff is buried deep in the depths of your blog, and no one is going to see it anyway. Right? As you probably know, one of the main benefits of blogging is the search engine optimization (SEO) value it provides. In fact, earlier this month, I analyzed traffic to this very blog and found that in July 2013, 69% of the blog post visits we received in July were to blog posts published prior to July. That’s a lot of traffic. And it makes sense considering that 45% of the traffic to our blog in July came from organic search. This means that any given moment, someone could stumble upon a blog post you wrote months (even years) ago that ranks well in search. This is one of the biggest advantages of blogging — content that continues to drive results in terms of traffic and leads over time. But if that searcher doesn’t bother to check the date/time stamp on that blog post, they might have no idea they’re reading outdated and possibly inaccurate information. Yikes. Okay, that’s one good reason. The other reason is that not everyone who is reading your blog now, was reading your blog months and years ago. And even if they were, it also doesn’t mean they read every single article you published. By updating and resurfacing some of your older yet high-performing evergreen posts, you can extend the life of your best blog content as well as increase the results it continues to achieve over time. Finally, it’s often much easier and quicker to update and republish an old post than it is to write a new post from scratch. While I wouldn’t recommend you do this for every post you publish — you should still be publishing lots of new, original content — this is a great way to shave some valuable time off your content creation efforts while still maintaining a consistent publishing frequency. 1) Identify your top-performing posts. Inbound Links: According to our resident SEO expert Rebecca Churt, this is the most important metric to look at, since it is most indicative of search authority. Which of your posts have a lot of inbound links? Traffic: My recommendation is to look at your blog analytics, and specify the last full month as your time frame. 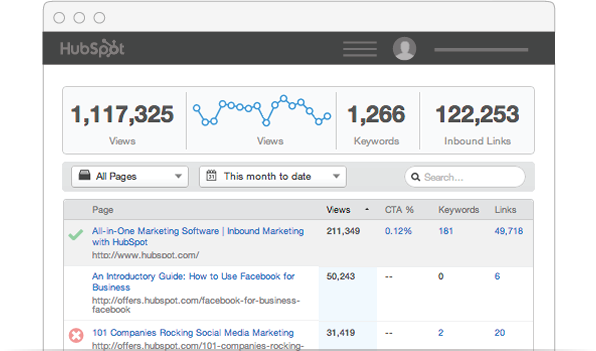 (HubSpot Customers: Look in Page Performance.) Which old posts are still generating a lot of traffic for you? Social Shares: The number of social shares a post has generated is also a good indicator of a high-performing post — particularly since social shares factor into search rankings, too. To determine how many social shares a post has, enter its URL into LinkTally.com, a free tool created by HubSpot Social Media Scientist Dan Zarrella that tells you how many times a URL has been shares on Facebook, LinkedIn, Google+, and Twitter. Keywords: Use updating and republishing content as a way to support your keyword strategy. Are there certain keywords you’re trying to rank better in search for? Use a keyword (like HubSpot’s Keywords tool or Google Analytics) to identify keyword ranking opportunities. Do you have any posts that already rank for these keywords? Could you improve their ranking positions? 2) Consider content relevancy and trending topics. In addition to a metrics-driven selection approach, you should also consider content relevancy and trending topics. In fact, depending on your content strategy and marketing goals, updating content for the sake of these two variables may actually trump a metrics-driven approach from time to time. For instance, we recently found that a lot of our prospects and customers were asking questions about local search. While we’d already published a post about this very topic, it had become a little outdated (and buried on our blog). Rather than create a new post from scratch (and risk rubbing Google the wrong way with duplicate content), we decided to update and republish that original post — even thought our metrics may not have indicated it was a good target for updating. Okay, once you’ve identified the posts you want to update, it’s time to actually update them! Here are some best practices to consider. 1) Use the same post, and keep URL the same. Rather than publishing an additional article on your blog — which could result in a ding from search engines for duplicate content — modify the original article. Because this article is live, I usually copy/paste the post into a new draft, make my changes there, and then copy/paste the HTML back into the original post when I’m ready to re-publish the original article (more on that in just a minute). While you may be tempted to update the post’s URL slug, it’s important to keep the URL the same, even if your software automatically creates a redirect. Redirects will remove some of the link value, so it’s best to just keep it as is. 2) If you change the title, keep keywords. If you feel compelled to update the post’s title, try to avoid changing it drastically from the original. While the URL is more important to keep the same than the title, if you really need to change the title, do your best to keep your keywords in there. 3) Add an editor’s note for transparency. 4) Update the content for accuracy. Remove content that is no longer relevant. Replace outdated data/stats with fresher, more timely ones. Add new, fresh examples or replace outdated ones. Update screenshots if things have changed (this is particularly important for step-by-step guides, etc.). Add any new best practices that have emerged (and remove “best practices” that are no longer so). Check and replace internal links (particularly if there are now better resources or lead gen offers for you to link to). Update the post’s call-to-action (CTA). Evaluate whether your CTA’s offer is still the best option for this post. Do you have a better article? Is the CTA’s creative out-of-date? 5) Optimize the post’s meta description. Review the post’s meta description. Is it still accurate? Can you update it to make it a little catchier? Remember, meta descriptions don’t affect the ranking of your content, but they can impact its clickthrough rate from search. Make sure your meta description is both an accurate reflection of what’s within the post, and enticing enough to get searchers to click through to your content from search results. Yay! By now, you should have an awesomely updated piece of content that’s ready for publishing. While the process of actually publishing your content will vary depending on the blogging software you use, I’m going to share some tips for doing it using HubSpot’s Blogging tool. Replace the old content with new content. This will probably be the same no matter what software you use. Like I mentioned, I usually copy/paste the HTML from my new draft to replace the copy in my original article. Wait until you want to publish the “new” post to update its date/time. If you’re using HubSpot’s new Blog COS, you’ll want to wait until the specific date/time you want the post to appear on your blog homepage to click “update.” Changing it to a date/time in the future will result in a 404 error for those who stumble upon the article in search before the newly designated publish date/time (not a good thing if your article already ranks well in search results). Send a manual email to instant subscribers. If your blogging software is (or is like) HubSpot, it will only trigger the automatic email notification to subscribers for a post once. This means that if you’re just changing the publish date/time on an already-live article, the email will not get triggered again. However, if you’re using HubSpot’s new Blog COS, there’s no stopping you from creating a manual notification email in HubSpot’s Email tool and sending it to your instant subscriber list. If you use the same template you use for your automatic emails, your subscribers won’t even be able to tell the difference. Plus, you can use the opportunity to run an A/B test! 7) Track the before/after performance. Are you incorporating updated blog posts into your blogging strategy? Share your tips and experiences in the comments below.